Self Adhesive Medical Wrap is a strong self-adherent tape that offers excellent support. It will not slip, eliminating the need for frequent readjustments. Unlike non-adhesive bandages, self-adherent tape wrap does not require clips and pins to stay in place. Material is water-resistant and will not easily come loose by sweat or water. Porous fabric allows for ventilation so the skin can breathe underneath, which is good for the skin and better for healing. 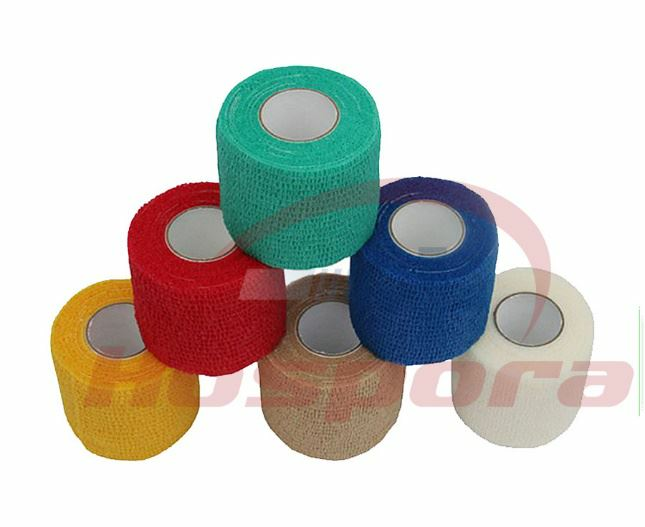 The cohesive stretch tape and wrap is incredibly gentle for all types of injuries. Suitable for body parts, such as ankle, wrist, finger and so on, can provide for swelling, dressing woounds, sprain and general soreness. The Self Adhesive Medical Wrap are highly praised and trusted by customers for its excellent performance and quality, reasonable price, and perfect service system. We have professional QC system, and checked the products one by one, so that we can make sure the products with the high quality.